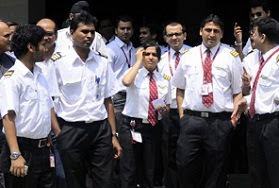 New Delhi:(Page3 News Network)-Aviation regulator DGCA will review on Monday Kingfisher Airline's operations in the wake of mass cancellation of its flights, even as a section of the airlines Mumbai-based pilots joined in the strike by its engineers. "We will review the situation of Kingfisher Airline," Director General of Civil Aviation Arun Mishra said. Mishra also said that airline's situation will also be discussed with the Civil Aviation Ministry. The engineers of Kingfisher went on a strike on Sunday to protest the non-payment of salaries since March. "Almost all Kingfisher aircraft are grounded due to the engineer's strike....some Mumbai-based pilots have also joined in the strike today," sources said. The airline, saddled with huge debt, is currently operating less than 50 flights with seven aircraft. Civil Aviation Minister Ajit Singh recently said that government will revoke KF's license if it's fleet size goes down below five.